A Working Agreement between KACPH & Momentum Sports. 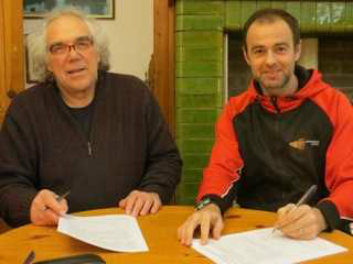 This was signed off by the Club's Chairman, Les Hatton, and Momentum's CEO & Head Coach, Richard Holt, on February 26th 2019, after two years of discussion and meetings, to finalise a Working Agreement (MoU) between the two organisations. The views of over 12 Committee Members were collated and agreed together with the team from Momentum Sports, to formalise without any legal constraints, an understanding of each organisations' modus operandi and how each will work together for the future of Track & Field Athletics at Kingsmeadow. It has been a tortuous exercise in some instances, but overall an illuminating one which has really cemented an understanding of each organisation's difficulties, and has provided a firm commitment of support for what each can give to our athletes. It reinforces the fact that to work together has more far reaching benefits than working apart. As with all non-legally binding agreements, our document is not written in stone, but will remain fluid and dynamic to respond to changes over time, and the current signed Agreement has sections still in their developmental stage. To highlight the requirements, responsibilities and expectations of both organisations. To outline the parameters within which the Club and Momentum may work in partnership, which will involve resolving concerns. To define the length of the Agreement and how often it is to be reviewed according to changes in development within each organisation. To understand that it is not a legally-binding Agreement but in signing the MoU, each organisation acknowledges it will use its best endeavours to implement individual and joint responsibilities. In normal circumstances, a Working Agreement, or MoU, would require only a basic review of each organisation and would present the Agreement as a factual summary of combined aims and objectives. In this case, setting the need for a Working Agreement between the Club and Momentum within an historical background of difficulties and solutions, would remind both parties of the journey taken to reach this point. This first Working Agreement provides archive material which was not always recorded in Committee Minutes, nor in Momentum's records and will act solely as a guide for future and less detailed Agreements. 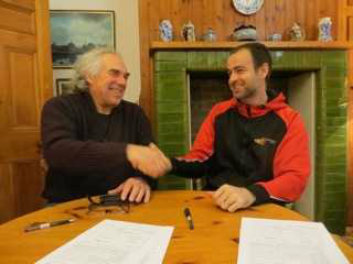 Our Working Agreement (MoU) will run from February 2019, during the T&F Indoor and the XC championship season and will be ongoing with working parties discussing outstanding issues.. It will run subject to Review during July and August so that by September 2019, when T&F is coming to an end with the new Cross-Country (XC) season starting, the necessary refinements to the Agreement are in place. What each organisation shares and benefits from working together, and how they understand the problems their differences make. To agree the benefits and expectations of each organisation and to focus on areas not working as well as expected. To revisit each party's responsibilities and check that coaching provision remains fair and across all Training Groups. Between Reviews, it is recommended that an open dialogue remains between both parties. A full Review to take place annually each February and changes made by agreement from both parties. Should any breakdown occurs in this Working Agreement which severely affects the day to day working of this Agreement, then an immediate emergency meeting is to be called by relevant persons to attend to the resolution of the problem as soon as possible, and within the bounds of KACPH Rules and those of Momentum Sports. The signatories will be senior executive members of each organisation.